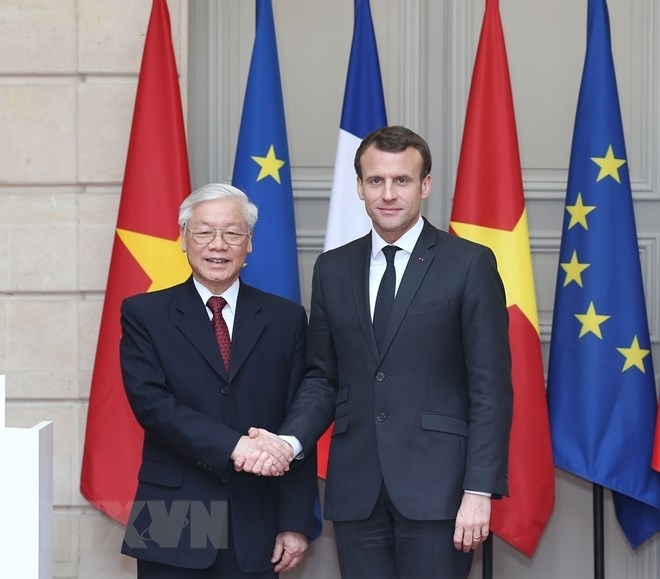 (VEN) - Forty-five years after establishing diplomatic ties and five years after upgrading bilateral relations to a strategic partnership, Vietnam and France are identifying opportunities to boost their relations to a new high commensurate with the traditions, potential and position of the two countries. The recent visit by Vietnam Communist Party General Secretary Nguyen Phu Trong to France contributed to deepening this relationship. The visit marked the first meeting of high-ranking leaders of the two countries since French President Emmanuel Macron took up office last year. It took place in the context of the 45th anniversary of Vietnam-France diplomatic ties and the fifth anniversary of their strategic partnership, and a key period of trade relations between Vietnam and the EU. In a joint statement issued following the meeting between party chief Trong and President Macron, the two sides said they had reached a consensus on varied measures to boost bilateral cooperation in a wide range of political and economic fields, culture and education. The two leaders expressed their determination to increase economic, trade and investment cooperation, and promote business access to each other’s markets. They reaffirmed their wish to strengthen long-term economic and industrial partnership, especially in infrastructure, transport, energy and space. At a meeting with the media, party chief Trong emphasized that Vietnam and France, though located on different continents, have close historical and cultural ties, sharing many values and similar interests. Increasing bilateral cooperation is in line with the demand and interests of the two peoples, he added. Party chief Trong said he hoped the French government would create favorable conditions for French businesses to increase imports from Vietnam. He also encouraged French businesses to increase investment in Vietnam. During the visit, party chief Trong met with French businesses. He affirmed that Vietnam welcomes and highly appreciates French investment projects that are in line with Vietnam’s development orientation and investment attraction policy. France currently is the largest European provider of official development assistance (ODA) to Vietnam, with more than two billion euros disbursed over the past 10 years. French ODA is concentrated in fields such as finance, health, education, transport, rural infrastructure and vocational training. Trade between the two countries reached US$4.6 billion in 2017, up 11.6 percent compared with 2016, mostly of Vietnamese exports to France. At the meeting with the Vietnamese delegation, French Employers Association MEDEF President Pierre Gattaz said Vietnam is becoming a tiger in Asia with sustainable economic growth. He praised the Vietnamese government’s efforts to open the economy, promote institutional reforms and improve the investment environment, making the Vietnamese market more attractive to French businesses. Moreover, he believes the growing middle class in Vietnam will create many opportunities for investors, including French businesses. On this occasion, Vietnamese and French businesses signed cooperation deals valued at more than US$7.5 billion. The VietJet Aviation Joint Stock Company and the Safran-CFM Group signed a memorandum of understanding (MoU) worth US$6.5 billion, under which Safran-CFM will supply Vietjet Air with 321 engines for 148 airplanes and provide technical services, engine maintenance and human resource training. The Safran-CFM will also assist Vietjet Air in improving fuel efficiency, technical management and building maintenance facilities meeting regional standards. Vietjet Air also signed a contract worth US$800 million to hire/purchase six A321neo airplanes from Gecas France. FPT Software and Airbus signed a Letter of Intent, looking for opportunities to develop aviation technology related to Airbus’ Skywise, a recently launched aviation data platform. FPT also signed with Geopost an MoU on helping to modernize the information technology system and improving the operational efficiency of Geopost. Vietnam’s T&T Group and Boyugues Group signed a cooperation agreement worth 250 million euros on upgrading the Hang Day Stadium. 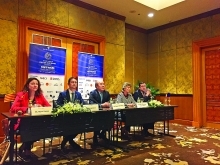 Vietnam has attracted US$2.78 billion of French foreign direct investment, placing France in 16th position among 128 countries and territories investing in Vietnam.